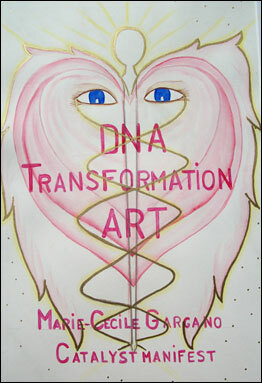 DNA Transformation Art is the new direction that evolved from the SoulSelf Portraits. It is Divine frequencies translated into a personal watercolor created specifically for the purpose of clearing all debris and "baggage" from your DNA's ancestral lineage at unfathomable levels, thereby causing an instantaneous full DNA activation followed by a transformation as it expands into realms previously unknown to your Humanness. You will notice that each picture displays common symbols, these reflect the 99.9% of the DNA that is identical in all. The remaining 0.01% making each absolutely unique is expressed through the colors, shapes, flow of lines and other details relevant to you.